Sterling’s Snagging Wheels are manufactured for a wide use of heavy stock removal in foundries, welding shops, metal fabricators, steel mills, shipyards etc. 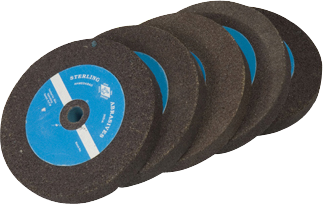 Sterling offers a complete line of engineered snagging wheels of high performance and many types such as Straight Wheels, Flaring Cups, Cones and Mounted Points. Snagging wheels can be used on portable hand grinder, Pedestal grinder and swing frame grinder. Typical Application : Smoothening of weld seams, Cleaning castings, Preparing surfaces for plating or painting, BIiiet conditioning etc.